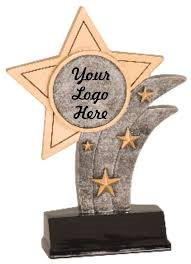 5 inch Star Resin with 2 inch circular insert for your favorite sport or logo. Great for recognition award of any kind! LIMITED SUPPLY. DISCONTINUED ITEM. 4 AVAILABLE.